December 16, 2016 — The Germs really know how to tinsel a Tannenbaum, so I guess it’s no surprise that the “world’s largest Christmas store” is in a place called Frankenmuth—Frankenmuth, Michigan, that is. So I guess there’s some surprise. Frankenmuth was settled in 1845 by Lutherans from the Franconia region of Germany (now basically Bavaria), and, today, the small city is Bavarian-themed, with architecture and food right out of that region of Europe. 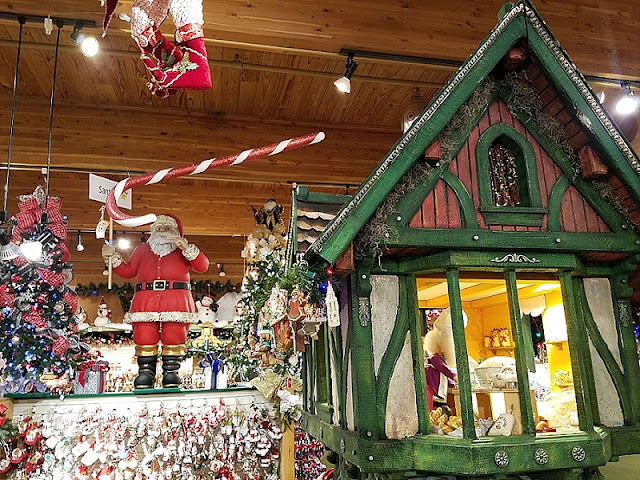 And while I did finish my stay in Frankenmuth by eating bratwurst at a place that looked liked it should be nestled on an icy mountain crag under a ski lift, I was really in Frankenmuth for that Christmas store. See, it’s hard for me to turn down a year-round Christmas store, regardless of the time of year. This time happened to be July during a summer road trip among the Great Lakes, but I’d always much rather have prancing reindeer over my head than exploding fireworks. Pulling into the parking lot, though, I at least wished I had timed it for a night visit. 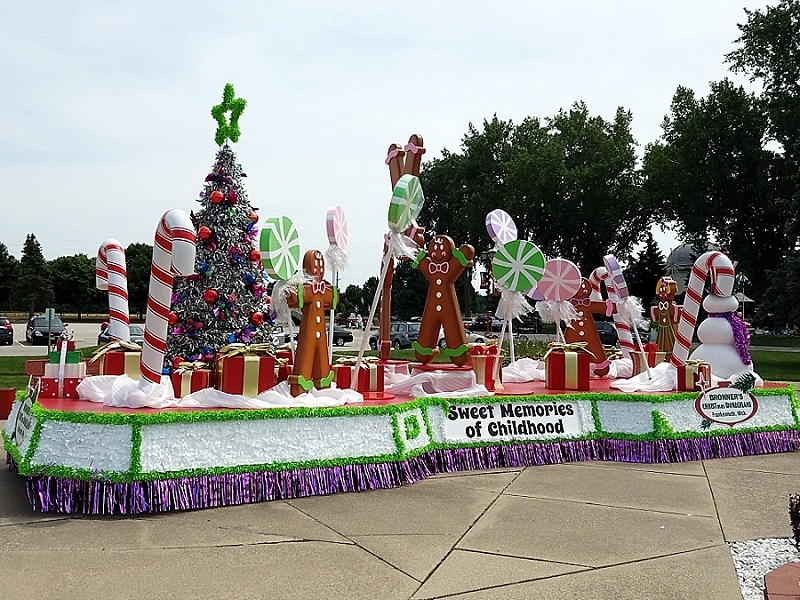 The lot was lined with light sculptures, meaning we could’ve knocked off a Christmas tradition six months early. But there were day-time decorations, too, like a Christmas float and a nativity scene and a Santa Claus the size of King Kong, the latter of which makes me want to rewrite the myth of Santa as a massive giant that stomps the houses of the naughty and lifts the roofs of the nice to deliver presents. Have Yourself a Merry Little Christmas would become a song of irony. The asymmetrical series of warehouses that is Bronner’s was bedecked with enough red, green, gold, and silver to make Saint Nick himself wonder if one could take Christmas too far. And it was big enough to fit a mall full of my giant Santa Clauses. 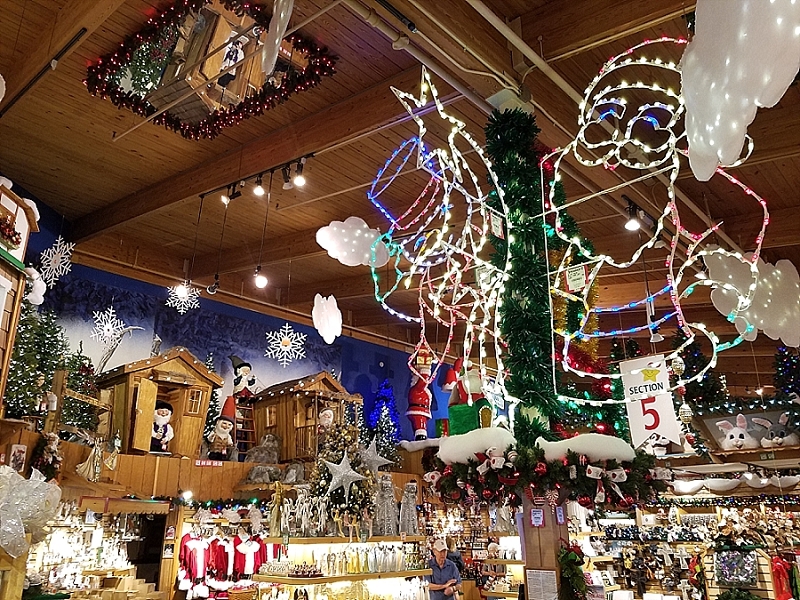 I don’t know if Bronner’s is the world’s largest Christmas store (the title is self-proclaimed), but five and a half football fields worth of sparkly Kalkikmaka is impressive either way. The ho-ho-whole thing was started in the pre-Rankin/Bass 1950s by a man named Wally Bronner. He, like his German forebears, was a devout Lutheran. And I only bring that up so that you know why the website and the store both capitalize the entire first syllable of Christmas with just about every usage. Unlike his Lutheran forebears, though, he was also a sign painter. That’s how his Christmas career started, by painting Christmas banners. 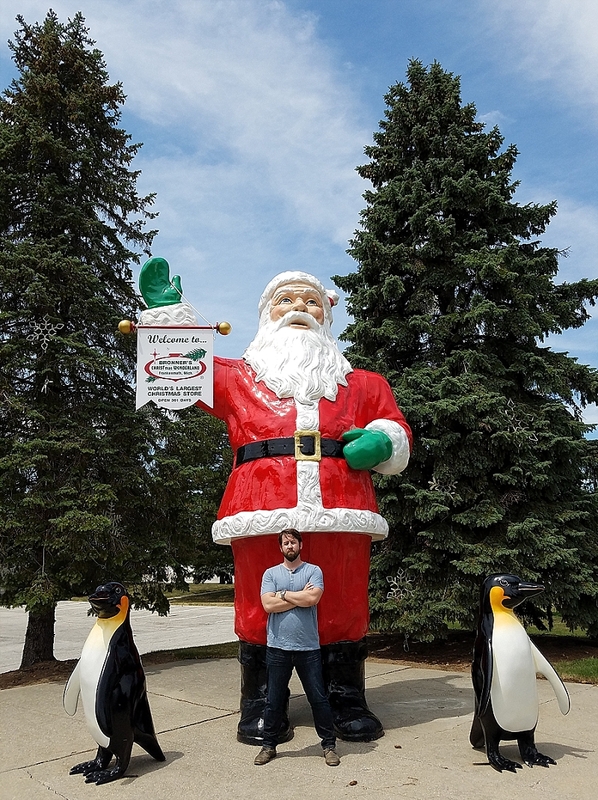 After opening a shop downtown and then growing into a couple more, he finally moved his entire Santa workshop to the outskirts of town so that he could holly some serious jolly. He died in 2008 at the age of 81, after what I can only assume to have been a wonderful life (both in the sense of a life full of Christmas and in the sense of wanting to jump off a bridge every December). The business is still family-run. Christmas carols piped tinnily over the speakers as we got out of our car and headed to the entrance. Inside, it was hall-to-hall decked with Christmas (and one staunch Halloween display). Candy canes and silver lanes were aglow. 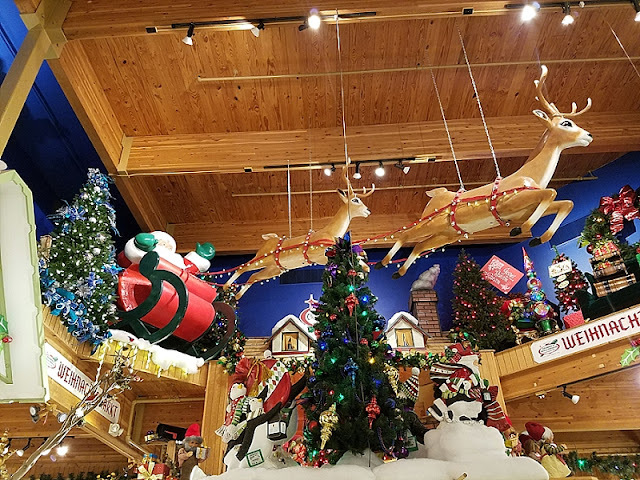 There were aisles full of blow molds, a forest full of fake Christmas trees, ceilings full of life-sized reindeer, racks of Santa costumes. Just Clauses and Christ-childs as far as the wondering eye could see. Surprisingly, I didn’t see a lot of gimmicks inside. Like the indoor snow at the Yankee Candle Flagship Store in Massachusetts. Or the indoor villages of The Christmas Loft stores in Vermont and New Hampshire. 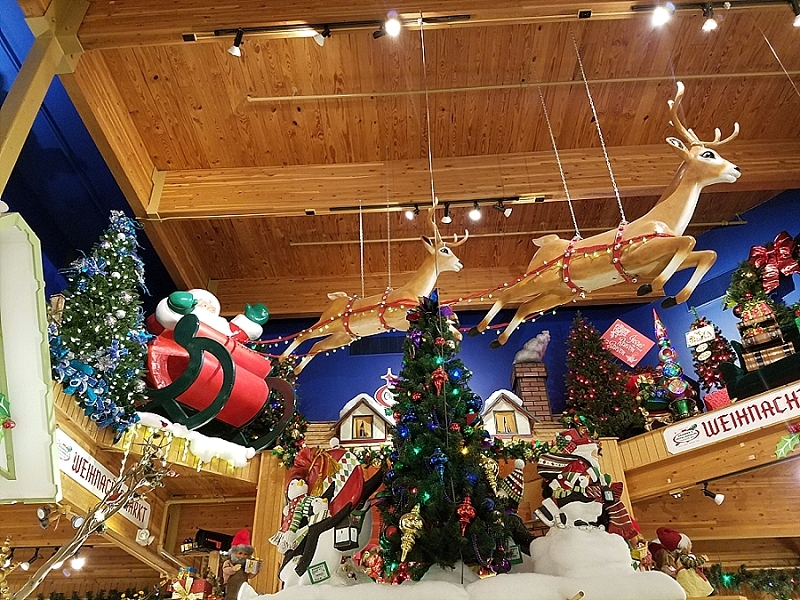 It was more like a Christmas Walmart, although with wooden ceilings and Astro-turf covered floors instead of metal roofs and dingy white tile. Its virtual tour is mesmerizing. Even in the summer, it was packed, both with curiosity seekers like ourselves and serious Christmas fanatics with full shopping carts and a list as long as Santa’s. 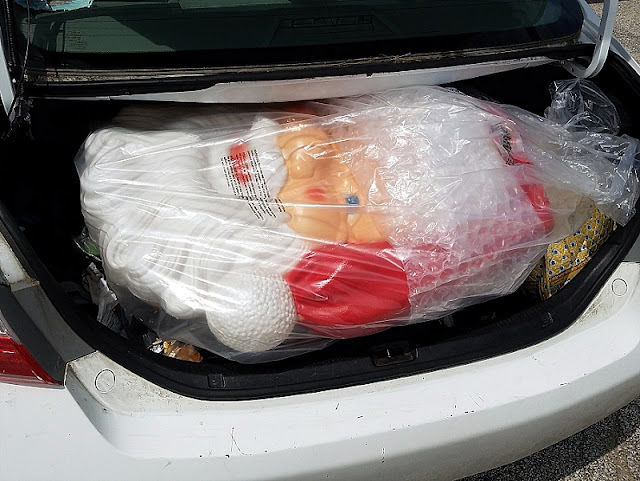 We ended up buying something ourselves before we left, of course, even if it barely fit in the trunk of our car and even though we still had thousands of miles to go before we could get him home for the holidays. 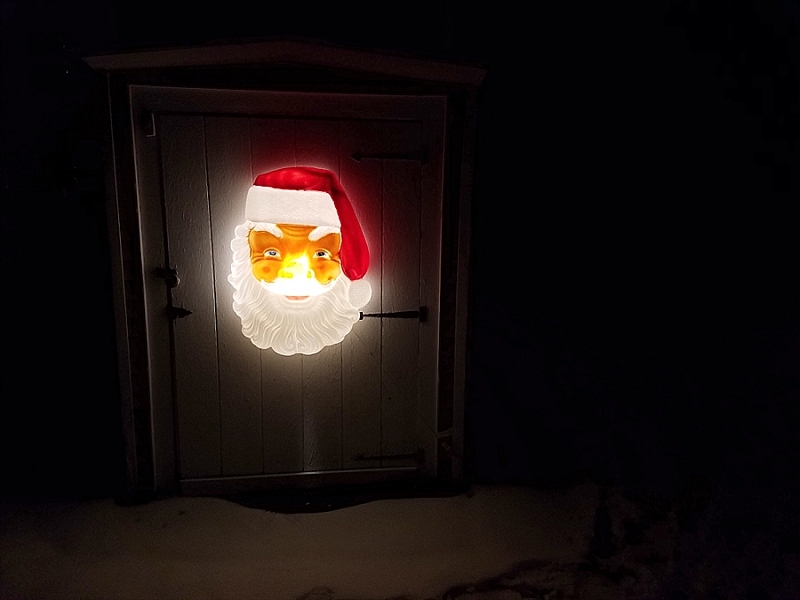 But two weeks ago, we finally put him up. He looks happy. And cold. Want more oddity like this in your life, as well as the stories behind the stories? 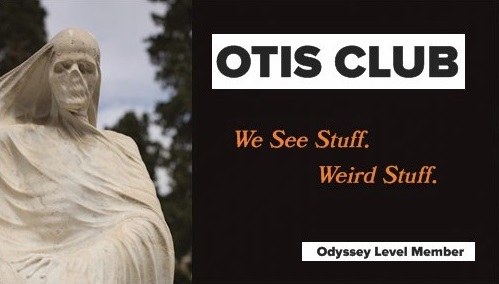 Join the OTIS Club, where you can receive the OTIS Club newsletter for as low as $1 a month, plus many other benefits.